Turning the Pages of Texas is a collection of sixty essays about Texas books, authors, book collectors, libraries, and bookstores. It is a book for booklovers and bookish readers. Lonn Taylor writes from the point of view of a historian who has been reading books about Texas for seventy years, since he was seven years old, and who has known many of the authors he writes about. He presents his reflections about well-known figures such as John Graves, J. Frank Dobie, and Larry McMurtry. 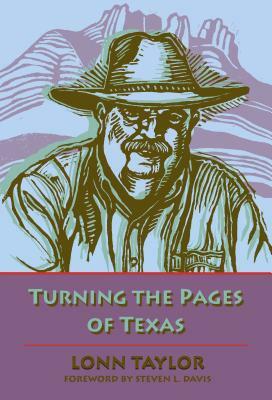 He also introduces readers to people like folklorist C. L. Sonnichsen, who wrote about Texas feuds; Julia Lee Sinks, who interviewed early settlers of Fayette County in the 1870s; Karen Olsson, who wrote a fine novel about the mystique of Austin; and David Dorado Romo, who describes himself as the “psychogeographer of El Paso” and is the grandnephew of a saint. Some of the authors Taylor writes about are truly obscure, like Gertrude Beasley, who published her autobiography in Paris in 1924 and died in a New York insane asylum, or Tony Cano, whose self-published autobiographical novel describes what it was like to be poor and Mexican in West Texas in the 1950s. Taylor also teases out the Texas connections of writers as diverse as William Sydney Porter, Hervey Allen, and H. Allen Smith, and he writes about tracking down Texas books in London and Washington, DC, as well as at Barber’s in Fort Worth, the Brick Row Book Shop in Austin, and Rosengren’s and Brock’s in San Antonio. This is a booklover’s book. LONN TAYLOR retired in 2002 after twenty years as a historian on the staff of the Smithsonian Institution’s National Museum of American History. He is originally from Fort Worth and is a graduate of Texas Christian University. He is the author of numerous scholarly books and articles on the architecture and decorative arts of the Southwest. He lives in Fort Davis, Texas, where he writes a weekly column for the Marfa Big Bend Sentinel. His most recent book is Marfa for the Perplexed, published in 2018 by the Marfa Book Company. He is married to Edith Uunila (Dedie) Taylor.